Forgive me folks, for diverging a little bit from the Rivoli Theater. I’d like to make a special mention of one of my own favorite outdoor theaters- the Ski Hi in Muncie. Starting on Friday, March 18, the Ski Hi Drive In in Muncie Indiana was demolished. Many of us have wonderful memories of the Ski Hi, and the unceremonious end to the theater may have certainly come as a shock. The truth is, the Ski Hi was doomed many years ago. It’s no coincidence that the drive in’s last year of operation was followed by the implementation of daylight savings time in 2006. Back in 1993, the question of daylight savings time was asked of then-owner Jim McClary, who had purchased the drive in from Y and W Theaters in 1989. (You may remember from my previous posts, that the last owner of the Rivoli, Dave Battas, began his theater career working for Y and W at the Ski Hi in the 1950’s). McClary was asked by the Ball State Daily News DN 7-8-93 Vintage Reel Estate article just how much longer can the drive in, this icon of summer activity hold out? His response- “as long as Indiana doesn’t go on daylight savings time, I think we’ll be all right.” He went on to note that if daylight savings time were in effect, the first movie couldn’t be shown until 10pm, and that creates a problem for families and children. In 2002, the Ski Hi closed, then reopened briefly in 2005 before closing permanently . 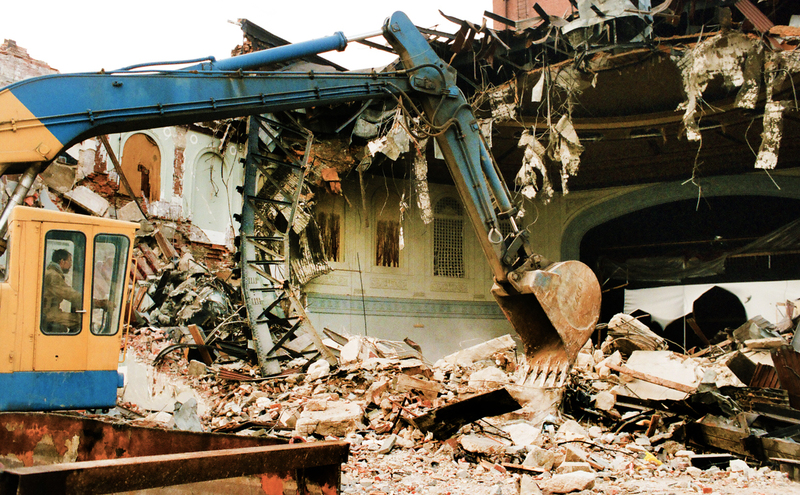 Year after year, the condition of the theater deteriorated. One of the last movies, Herbie the Love Bug, remained posted on the marquee for some time afterwards. Eventually, the elements began to take their toll on the projection screens as well as the projection booth and concessions stand. As you can see, by 2009 the theater screen had a hole in the roof and was open to the elements. The deterioration was much more evident. Its also important to note, for those of us who would have loved to see the Ski Hi re-open, that another obstacle was the movie industry’s move to digital projection starting in 2014. The estimated $70,000 digital projection system would be a tremendous financial burden to any drive-in theater, whose profit margins have tended to be narrow for the last couple of decades. In 2016, Delaware County announced plans to demolish the Ski-Hi Drive-In, built in 1952. County officials cited the drive-in’s failing structural integrity and its proximity to the busy intersection as reasons for tearing down Delaware County’s last drive-in theater. The screen was down. Small piles of twisted metal left in its wake. Severed foundation support struts served as a reminder for the countless winds the screen successfully endured by the Ski Hi’s sturdy construction. Heavy equipment was perched on top of piles of metal sheeting, to keep them becoming airborne in the spring weather. What was particularly striking to me was the poor condition of the concessions/projection booth. Those hoping for a possible reopening will likely be sobered by these images. The above image is from the projection booth, and yes that is water in the workbench drawer. On October 27th, 2015 I had the distinct pleasure of addressing the Association of Lifelong Learners at Ball State University’s Alumni Center. My topic was the Rivoli and the crowd was a large and enthusiastic one. When I asked for a show of hands as to who remembered visiting the Rivoli during its early years of 1928 to 1940, nearly a quarter of the audience of 100 raised their hands. I love talking to people about the Rivoli, because they so often have wonderful stories to tell. During the Q&A session following my talk, I learned two very interesting facts that I would like to share. 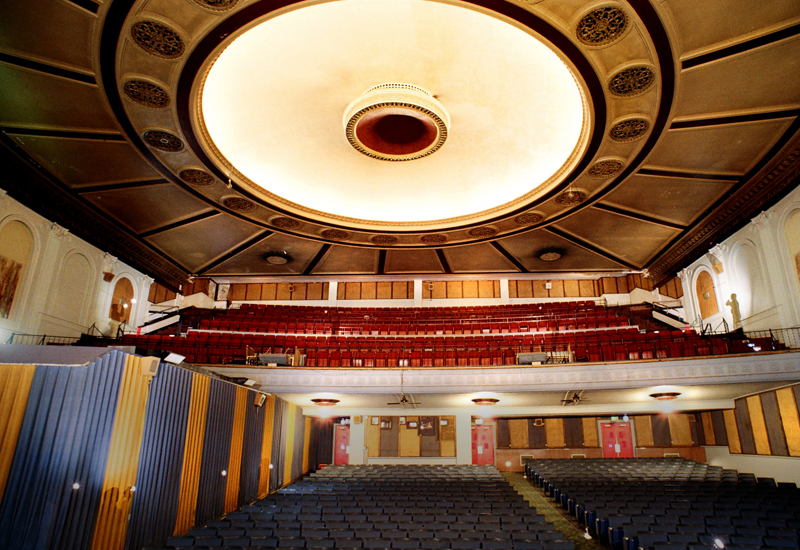 The first relates to the picture I displayed of the Rivoli dome, seen below. My recollection of the dome is how it looked in this photo I took in 1987. Even as a child visiting the theater in the late 60’s, this is how I remember the dome. However, a couple of people told me that their recollections of the dome were of the center area being illuminated with BLUE light. How interesting! Most likely, the theater staff covered the inner ring lights with some sort of colored lighting gel or utilized blue-tinted lamps. Below, you can see the inner lip of the dome and the illumination bank that circled the dome. This is where any blue light would likely have originated. I often mention how much of the Rivoli’s original ornate nature was lost to those of us attending the theater in later years. A large portion of the original plasterwork had gotten painted flat gray or white, and wall coverings made from cloth and other materials plus wood trim had long since been removed and remaining wall surfaces painted a neutral color. To illustrate my point, I displayed 4 photos. The first, of the Rivoli outer lobby, depicts a dark colored ceiling with hints of light colored designs. 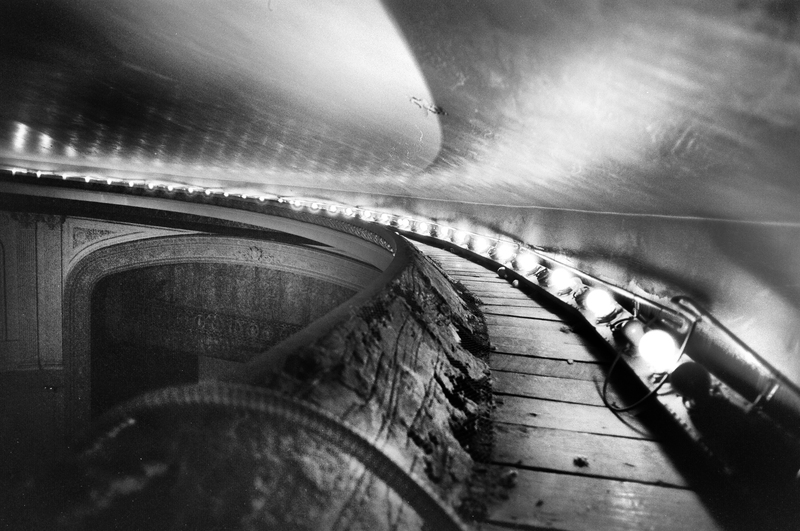 In later years, that same ceiling was white and illuminated with colored neon tubes running around the perimeter, as seen in the photo below. 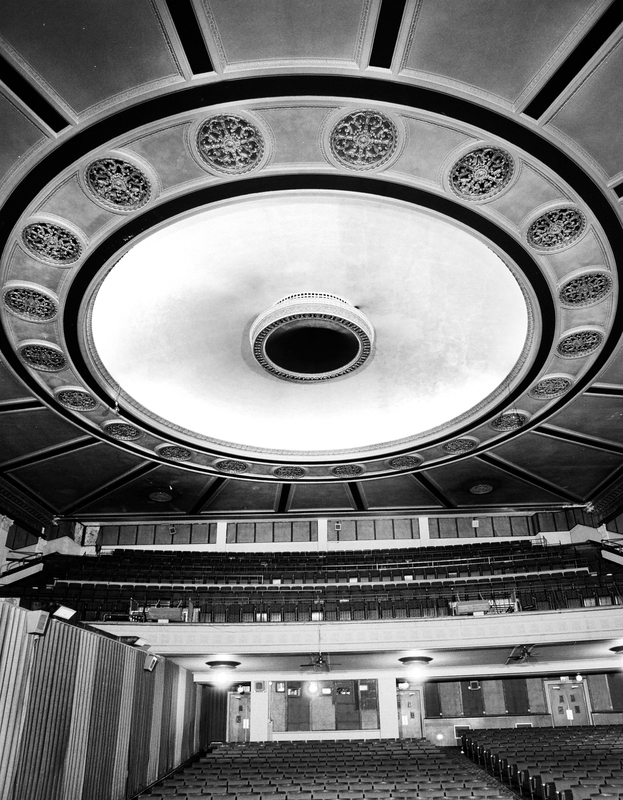 To my eye, in this 1955 black and white rendering the ceiling would seem to be likely a dark hue of red and the pattern a contrasting color of medium shading such as gold. Photos courtesy of David Battas, Sr. 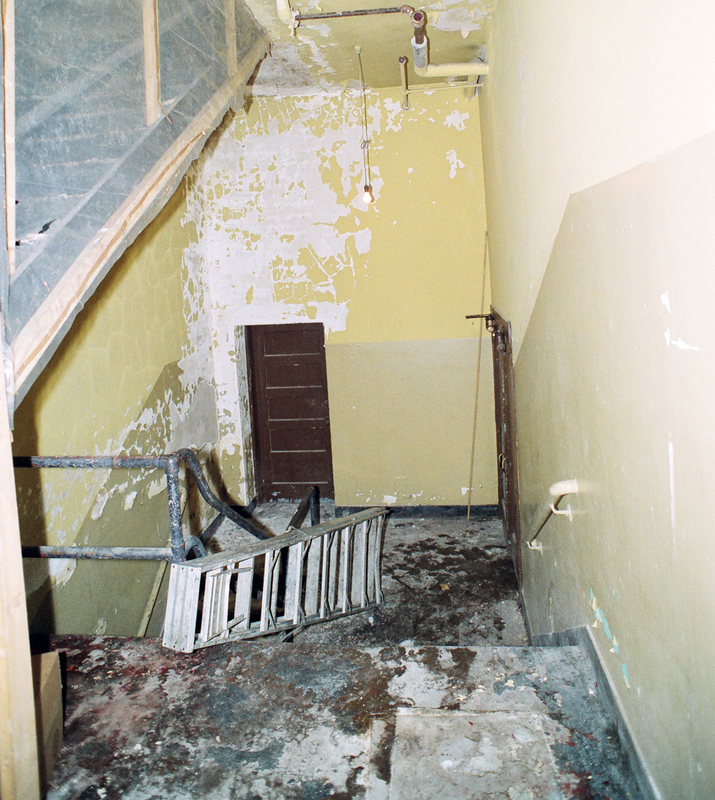 The second and third photos were of the Rivoli inner lobby. The top image below was taken in 1987 by yours truly, and the bottom was created in 1928 by local photographer Otto Sellers. 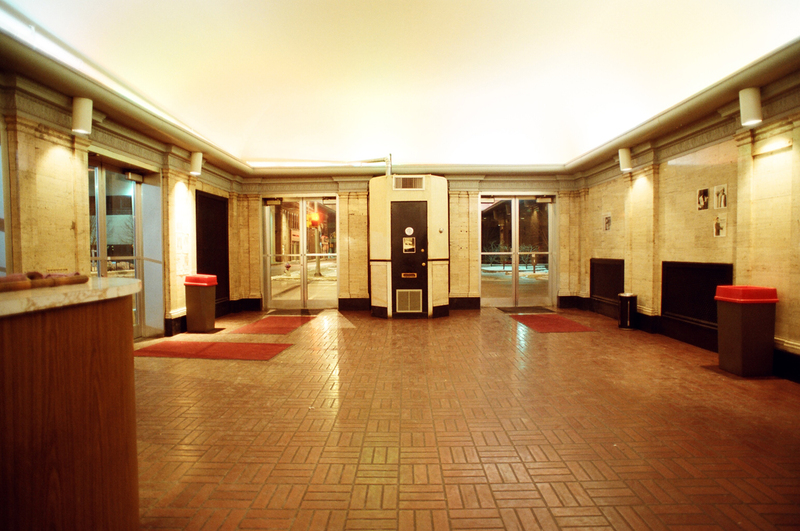 The 1987 image depicts the west end of the lobby, while the 1928 image reveals the mirror image of the east end of the lobby. Note the differences in stair railings, wall coverings, wood trim, and the plasterwork surrounding the room. The Rivoli was truly magnificent in 1928! Photograph by John D. Disher, c1987. Note the ornate plasterwork trim that has been painted flat white. 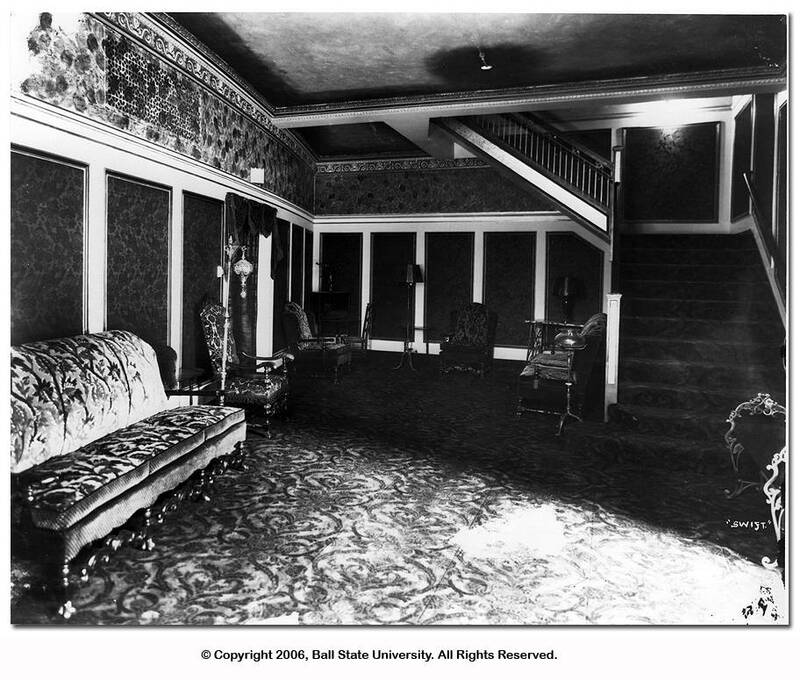 In the photo above taken in 1928, note the dark wall coverings and ceiling which Nancy Turner described as dark red. You can also see the woodwork that frames the ornate wall coverings, and see the sheen on the decorative plaster. Photo courtesy of the Ball State University Digital Archives is shown here for informational purposes. So…I set out on October 27 to share some of my knowledge with others, and came back with some new knowledge for myself. Seems like a pretty fair trade, don’t you think? Recently, I had the distinct pleasure of reconnecting with Thomas Ratliff, the former assistant manager at the Rivoli during its last days of operation. I have mentioned Thomas several times in previous posts, as he was singularly responsible for the incredible access that i gained to the theater for these photographs back in 1987. Thomas and i met for lunch and poured over the hard copies of my photographs. It was the first time we had talked in nearly 28 years, and we had fun reminiscing over the ‘adventure’ of climbing across the rooftop, into the dome and through the depths of the basement of the Rivoli so many years ago. One of the pictures we laughed about was the one below. I remarked to Thomas that I recently watched Invaders from Mars on Netflix just because I had to see what the Rivoli theater employees thought was so special about the movie. We decided the question would still stand, as Thomas couldn’t remember why the poster had such prominence in the projection booth. That’s Thomas at the lower right in the photo. “Not sure why I look so stern there,” he joked. Those of you around back in ’87 might remember that Thomas worked tirelessly to see if there were some options to save the Rivoli. He met with many of the parties involved and started a petition to save the Rivoli. I still admire his efforts to ‘take a long shot’ to this day. You can read a short news account of his petition efforts here. 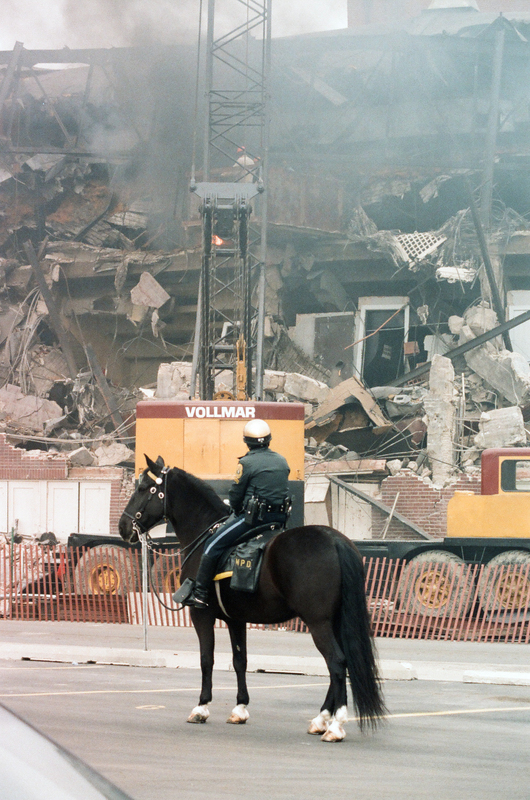 When we reached some demolition photos, Thomas noted that during his observation of the start of the demolition process “it was satisfying to see the first strike of the wrecking ball bounce off of the old girl’s bricks with no damage.” Unfortunately, a larger ball and more targeted strikes would ultimately break down the Rivoli’s strong construction. The photo below was taken as I stood on the stage of the Rivoli facing towards the seating area. 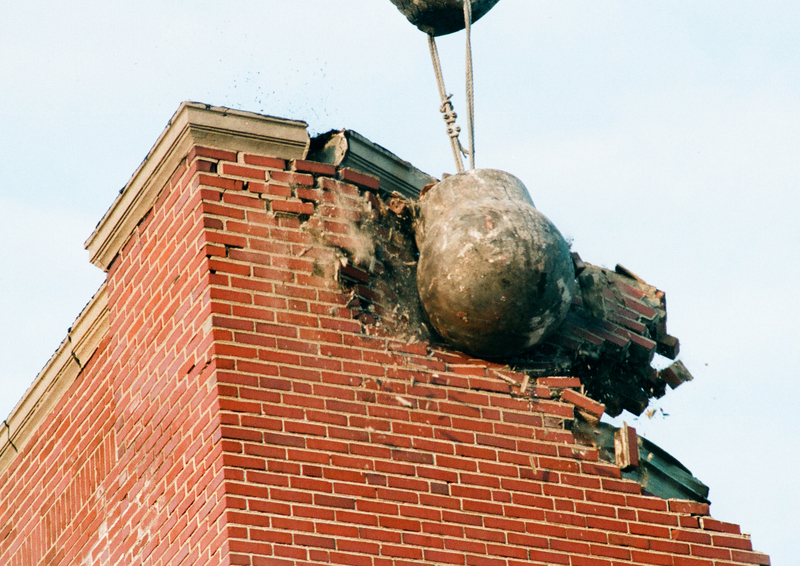 The wrecking ball. dropped from a crane outside the building, was driving violently downwards, through the roof. 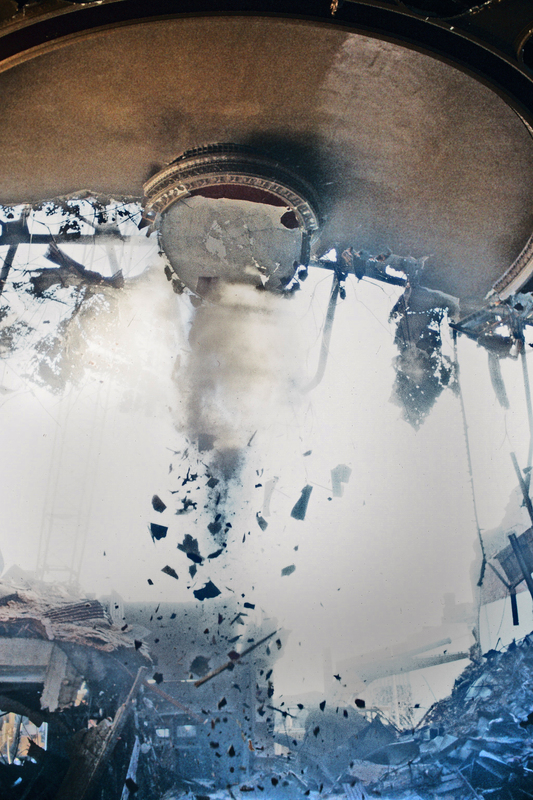 Ron Vollmar, the demolition expert on site, had given me permission to photograph inside the building as the ball was dropping. “Just stay on the stage,” he said, “and no harm will come to you.” He was right, and I was able to capture some fascinating images. I must admit that I much prefer to remember the Rivoli as depicted in the next photo. Magnificent. This photo was taken on Kodak T-Max 100 black and white film. Photo buffs will remember that the T-max films were introduced in the 1980’s and had really fine grain structure. When I had a darkroom, I used to make prints of this negative and would marvel at the fine detail and chrome-like quality of the film grain. Towards the end of my conversation with Thomas, I produced an interesting item that recenty came into my possession. It is a promotional give-away item from the Edward H. Wolk Motion Picture Equipment Company. The desktop calendar is dated January of 1961 and features a custom name plate for each client. 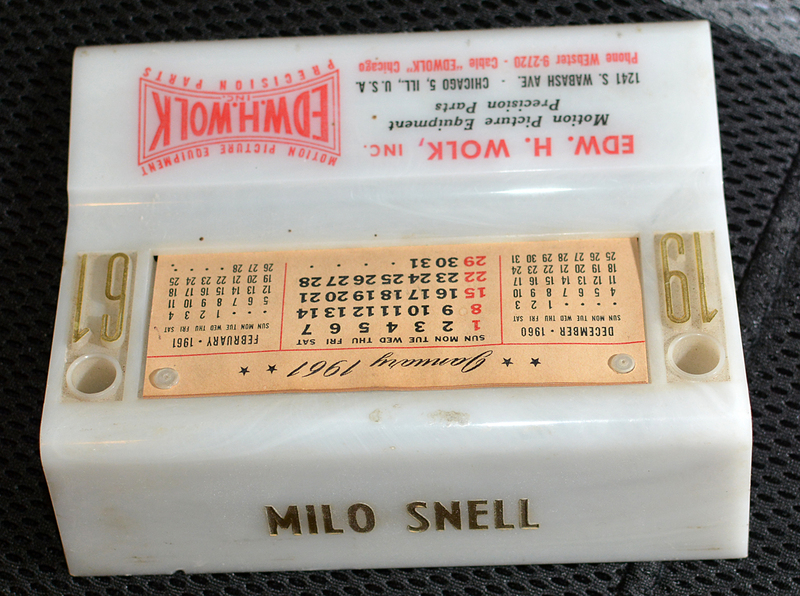 In this case, the calendar was origninally a gift to Milo Snell, the former projectionist and all-around handyman at the Rivoli and many other downtown Muncie theaters. We both agreed this was a pretty incredible find—at least for fans of the Rivoli! In closing, I’d like to once again thank Thomas Ratliff for making these photos possible. His passion for the Rivoli was and still is remarkable. And thanks to all of you for continuing to check out my Rivoli blog. As always, I welcome your comments and emails. You can reach me at jddisher@comcast.net. My photographic journey through the Rivoli in 1987 would not have been possible without the help and support of the Rivoli employees. During the time I spent with them I learned a lot about the Rivoli, and also heard the name of Milo Snell many times over. 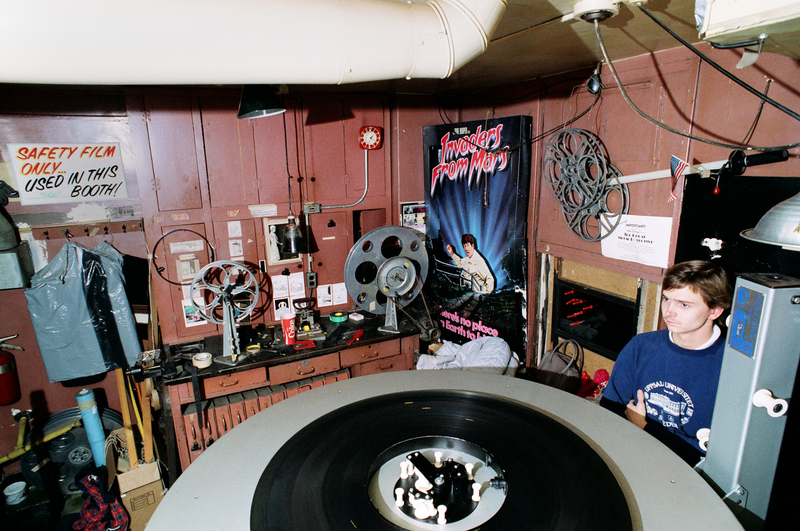 Milo was a projectionist and all-around handyman who worked at the Rivoli and other downtown movie houses. I’m not sure of the dates of his tenure, but he was well known by Dave Battas Sr. and his family. Dave was acquainted with Milo for many years—at the beginning of his career, Dave worked for the operators of the Rivoli—the Y&W Management company—starting in the early 50’s, and he later purchased the theater and operated it in the 1970’s with his wife Wanda and two sons. Note the "Y and W" markings on two of the shelf parts. 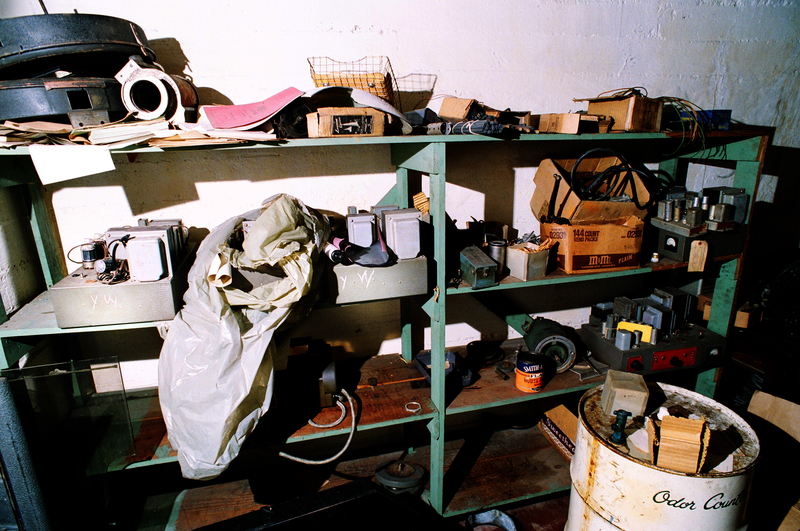 Basement workshop in the Rivoli Theater, 1987. Photo by John D. Disher, c1987. During my tour of the Rivoli back in 1987, a couple of the employees mentioned to me that the ghost of Milo Snell might be inhabiting the theater. Indeed, during my visit, lights in the basement workshop area would inexplicably turn themselves off and on. 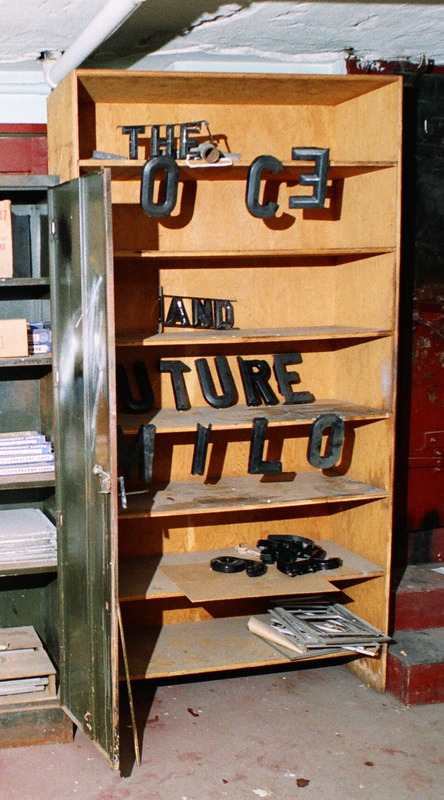 Rivoli employees arranged the marquee letters in the basement storeroom to spell out "the once and future Milo". Photo by John D. Disher, c1987. 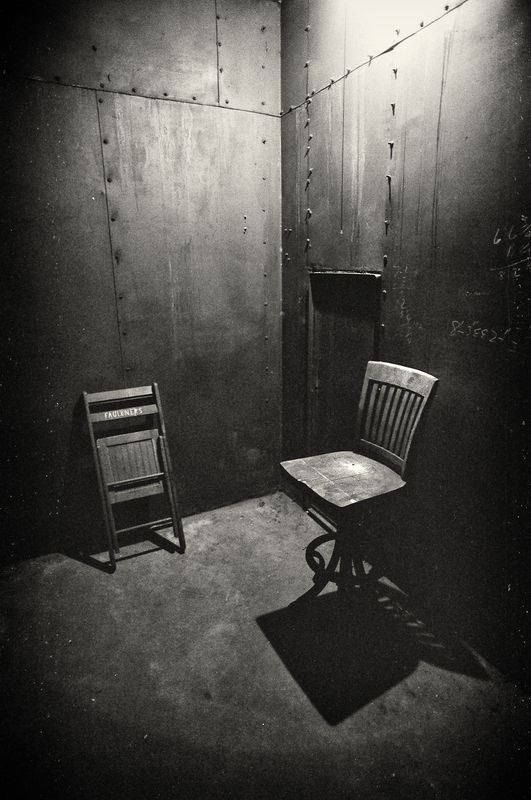 I entered a small room in the basement through a tiny door, which was actually a metal air handling chamber, and discovered two old chairs illuminated by a single light bulb and isolated from the rest of the world. One was a high-backed stool, and the general consensus among the employees was that this was Milo’s projection booth chair, still reserved for use in his now ethereal form. Metal air handling chamber in the Rivoli basement. Photo by John D. Disher, c1987. I would return to the Rivoli a few days later and purchase that same chair during a public sale. I’ve had it for 25 years and thankfully it’s not exhibited any paranormal activity during that time! Over the years I’ve often told the story of the chair’s history…so it was a disappointment when Dave Battas recently told me that it probably wasn’t Milo’s. He said none of the employees in 1987 would have had knowledge of what chair Milo would have used. And Dave told me to forget the business about Milo haunting the theater, or at one time living in the basement as stated in the newspaper article the Final Curtain Falls. Milo had his own house and was a wonderful asset to the local community during his tenure with Y&W. Its extremely unlikely that he had returned to haunt the Rivoli. Most likely, I’d probably been the victim of an overly enthusiastic imagination. Darn. So much for the ghost story. Well, it is a great chair and I will continue to enjoy it. Recently, I received a comment on one of my posts from former Rivoli employee Debbie Blair Richcreek. She shared some great memories about her tenure as an employee during the seventies, when she worked in the Rivoli Theater concessions stand and ticket booth. She also was part of a group of employees who helped paint the floors and walls of the Rivoli one summer. John: Thank you for posting these great photos of the Rivoli. I worked there throughout high school (approx. 1972- 1974) when the Battas family owned it and Mrs. Jackson managed it for them. One summer, Dave and Wanda Battas (and their young sons) hired the regular student staff for some clean-up and repainting in the theatre. We painted everything that could be painted and had the run of interior spaces we’d never seen before. 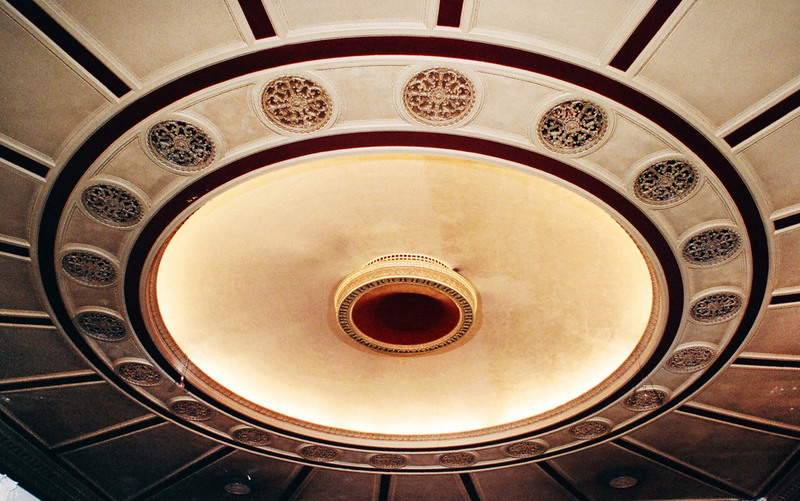 Rivoli ceiling dome, 1987. Photo by John Disher. Two of the older male students went into the dome to do some painting and I remember listening to them with awe as to what they found and their trek getting inside. I also remember watching them rather fearfully from the seats below as the rest of the crew (myself included) painted gallon after gallon of some sort of fancy, black “swirl” paint. It was back-breaking work and we quickly grew tired of swirling our paint brushes around every single leg of each movie seat! Hard work aside, we earned some extra money in addition to our regular movie shifts (I worked concession and graduated to the ticket booth). We polished and shined the brass pole that stretched across the theatre floor along the entire length of the stage separating the theatre seats from the pipe organ and I remember how beautiful it looked. Rivoli back hallway, stage left, 1987. I would ride my second-hand schwinn english racer from my Carson Street home to the theatre each day until the work was completed. The eerieness of the basement “catecombs” quickly gave way when we discovered they were actually dressing rooms for the old vaudeville theatre troops who performed there. Upstairs in the hallway storage areas behind the balcony, we found old movie posters from the 30′s and 40′s, top hats, feather boas and metal New Year’s Eve “noisemakers” left over from past performances and stored nonchalantely – nearly forgotten. 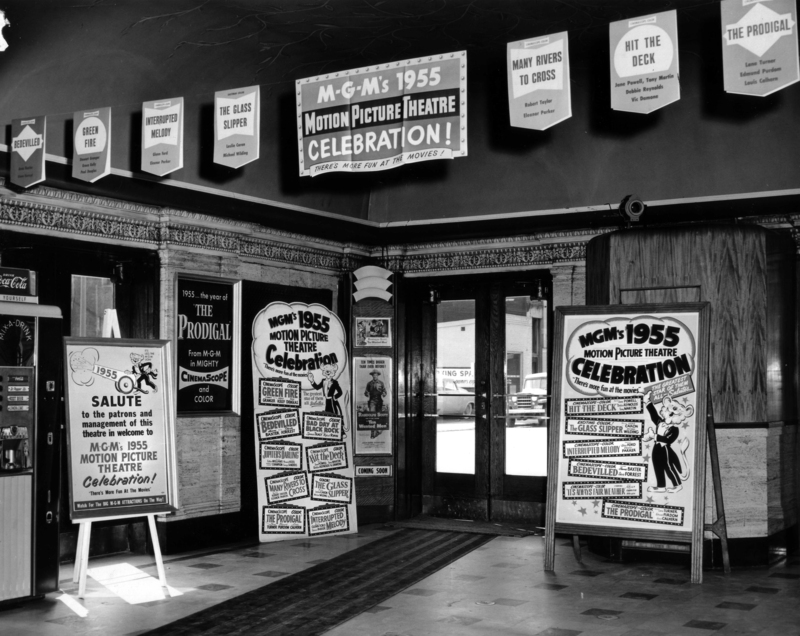 I would love to have one of those old posters now, but they belonged with the theatre as a piece of history frozen in time. 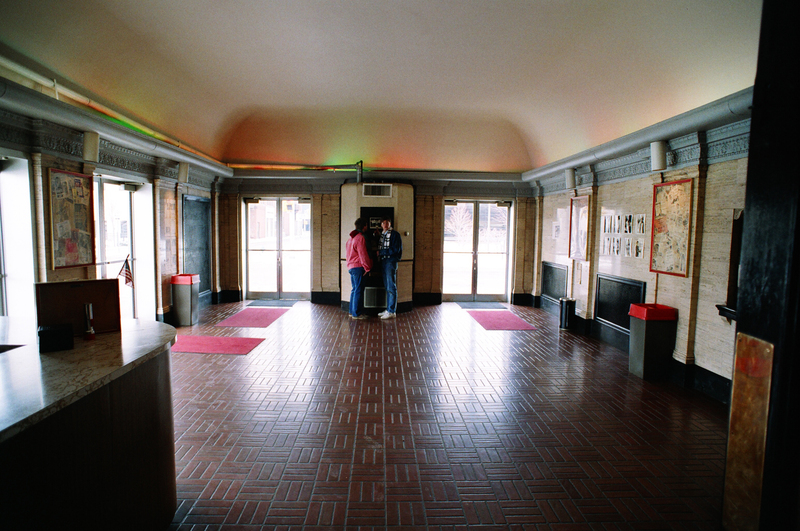 1953 Rivoli ticket lobby photo courtesy of David Battas, Sr. The kindly gentlemen projectionists (they seemed “old” to me as a teenager and I remember someone mentioning to me that they were “union”) – Milo and the others whose names I have forgotten – would somtimes pop out of the projection booth just long enough to get a fountain coke from our concession. I can still hear the sound of the movie film flipping around the reels as the projectionists seamlessly changed from one reel to the next without missing a beat. 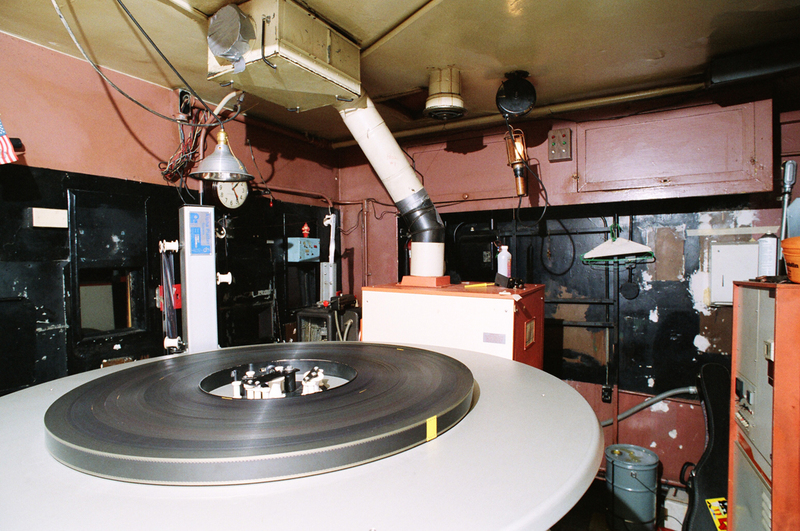 (without the projectionists, there was no movie). If I had a dollar for every time I heard the sinking of the cruise ship in the “Poseiden Adventure”, I would be rich – it must have held the record for longest running movie! How fortunate I was to have had the opportunity to work in such a beautiful, historic theatre and I still have very dear memories. Fire was a major concern for theaters in the early part of the century. By the time the Rivoli was constructed in 1927, it was standard procedure to equip theaters with a number of important fire safety features. 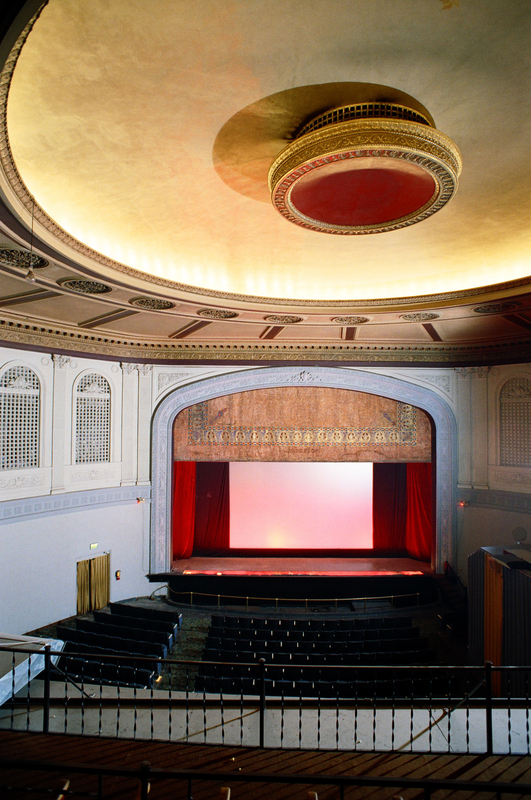 The asbsestos fire curtain, self closing stage doors, and fireproof projection rooms were designed to protect audiences in the event of a fire. 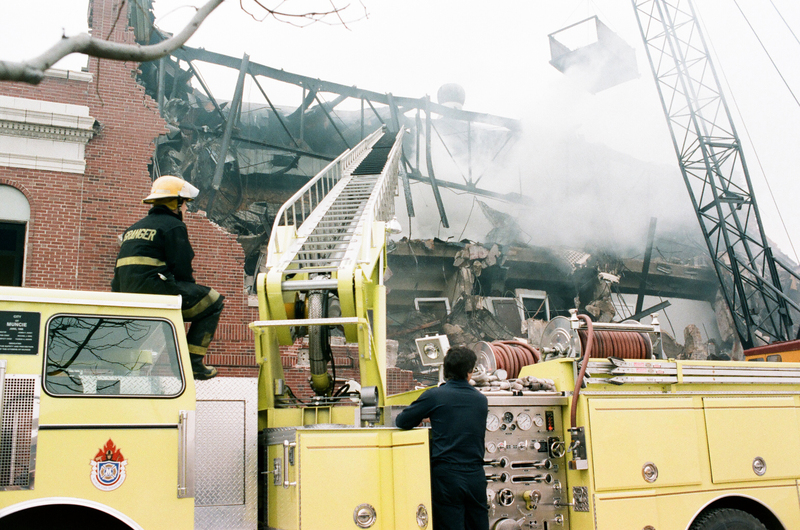 To my knowledge, there never was a fire at the Rivoli Theater…until the day it was torn down. During the demolition process, I would frequently stop by after work and watch Ron Vollmar and his crew as they went about their work. 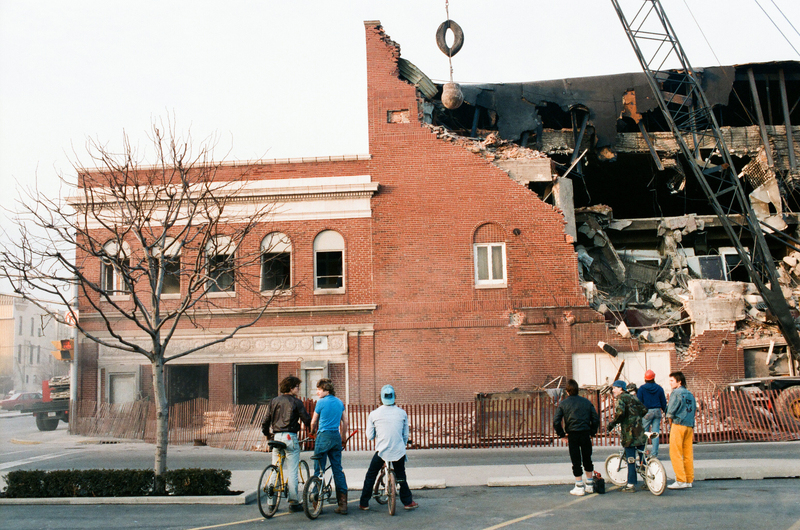 It was not uncommon to see a lot of other bystanders watching the action of the wrecking ball. I must say, it was pretty painful to watch my old friend slowly taken apart, piece by piece. 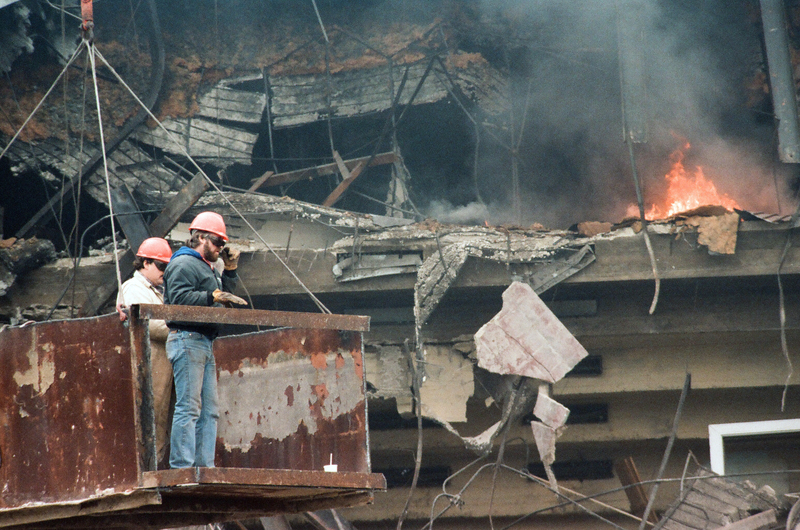 One day, shortly after I arrived to take a few pictures of the demolition, a fire broke out, caused by the cutting torches that workers were using to remove steel beams. Within a few minutes a Muncie Police officer arrived on horseback to observe the situation. 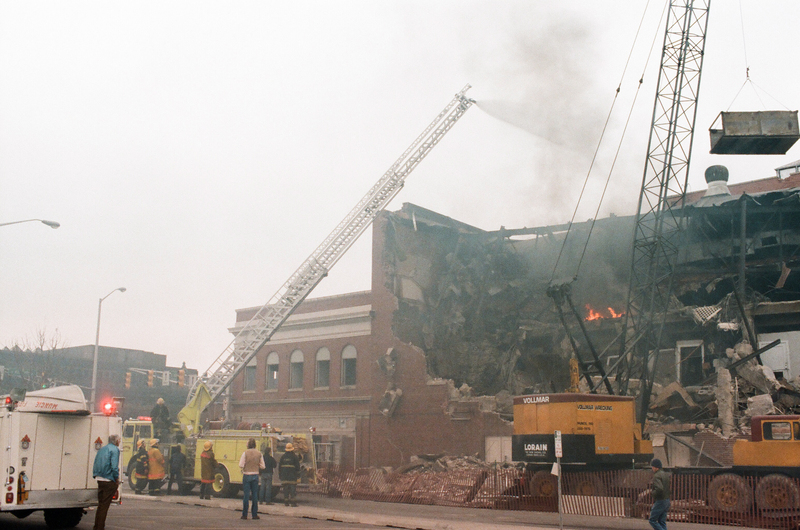 While the ladder was being moved into place, the fire grew a little bit larger, and the construction workers cleared out of the way. Next month we’ll go back down into the basement of the Rivoli and talk about the infamous ice machine that resided there! 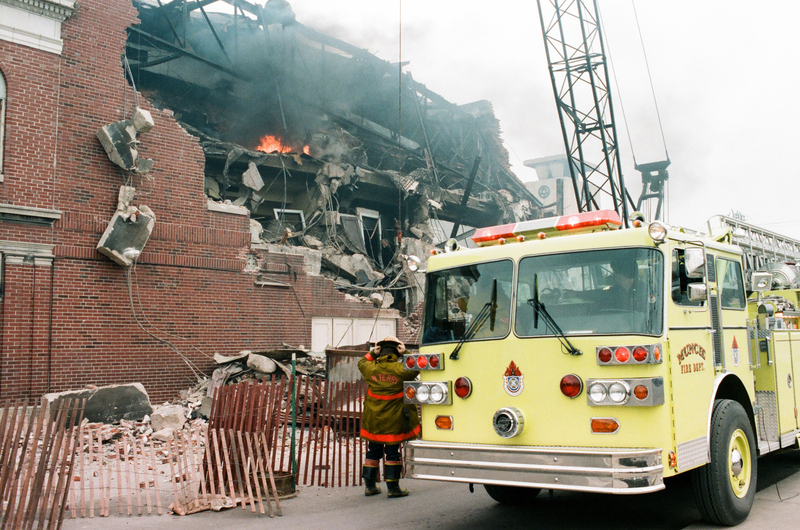 Friends, this month marks a special anniversary in the history of the Rivoli Theater. 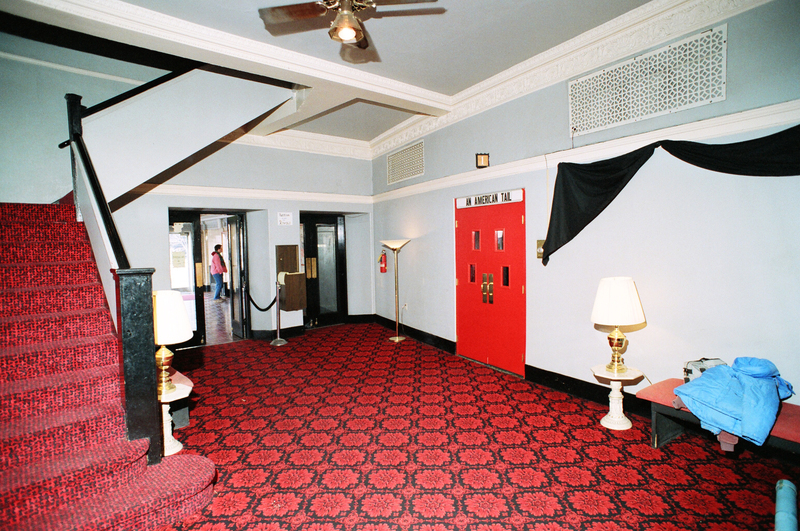 Twenty-five years ago the theater came to life with the magic of sound, light and celluloid for its final performance. The date was January 11, 1987, and the film was The Morning After starring Jane Fonda. 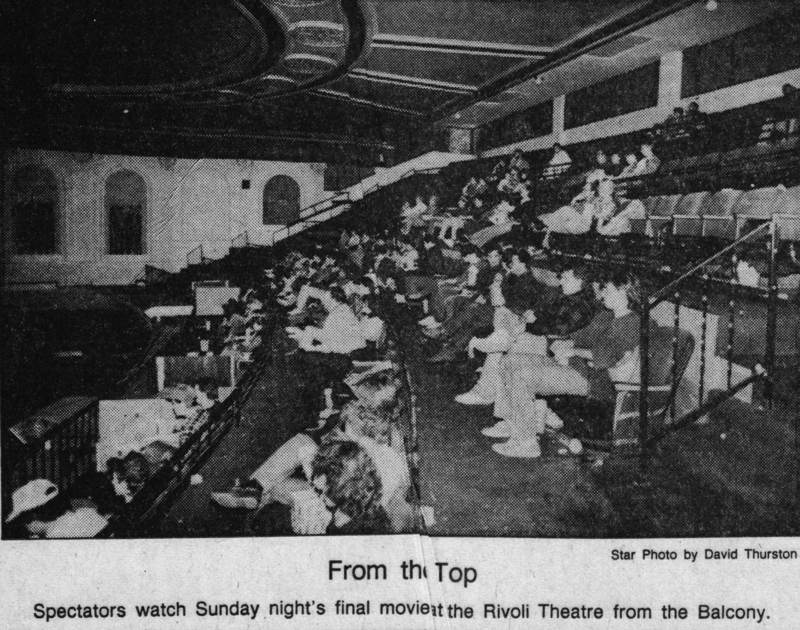 About 150 sentimental moviegoers gathered to enjoy the show and watch that final film flicker into darkness as the Rivoli’s projector clicked to a halt. 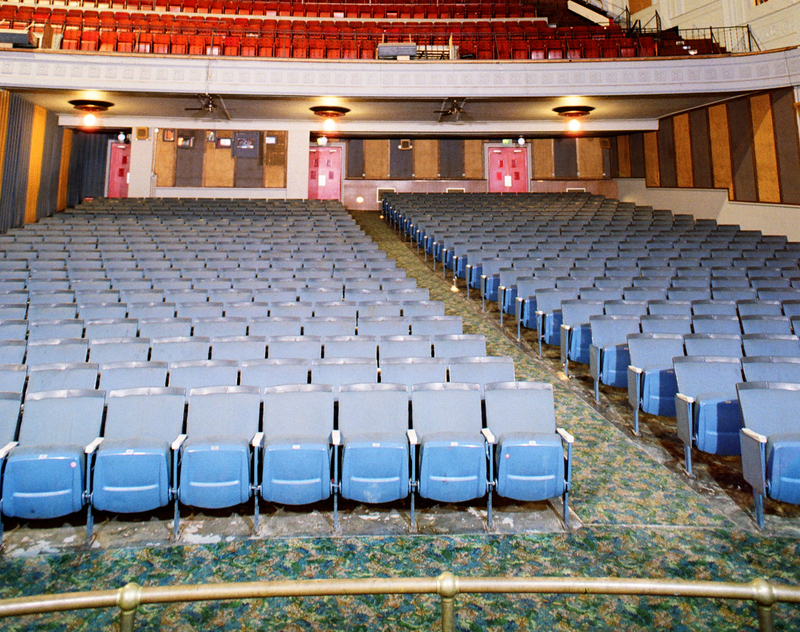 Afterwards, we sat quietly in the still auditorium, lingering among the ghosts and memories of entertainment history before starting our reluctant departure. The moment was memorable and unforgettable, the movie…well, not so much. 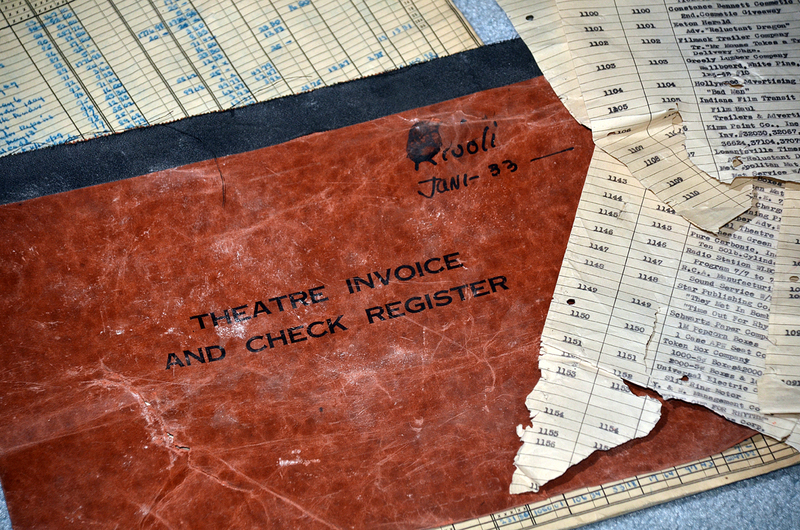 Thankfully, during its six decades of operations, many other, much more noteworthy films graced the Rivoli’s big screen…one of which I learned about in a very unusual way…..
During my photography of the Rivoli’s destruction in 1987, I discovered an old accounting ledger in the the dumpster rubble. Tattered and torn by the massive wrecking machinery, it yielded a fascinating treasure trove of information about the operation of the theater…in 1933. Today, it is still embedded with a fine layer of powdery demolition silt. 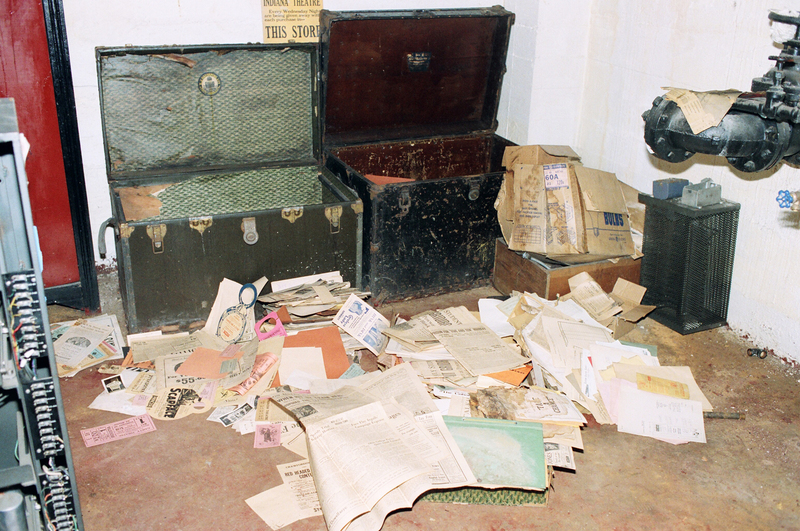 You can see it, highlighting the brown cover of the ledger. Perusing through its pages, I stopped at the entries for the week ending May 6, 1933. All are interesting items in their own right…. but the line that caught my eye was a payment to R.K.O. Pictures for $240.52. Wow. King Kong played at the Rivoli during its initial release in 1933. Wouldn’t it have been incredible to have seen the original release of King Kong at the Rivoli? To have heard the roar of that beast echoing throughout the room? To have seen him standing 20 feet tall, battling the Air Force from atop the Empire State Building? In 1975, Kong was named one of the 50 best American films by the American Film Institute, and, in 1991, the film was deemed “culturally, historically and aesthetically significant” by the Library of Congress and selected for preservation in the United States National Film Registry. In 1998, the AFI ranked the film #43 on its list of the 100 greatest movies of all time. And people in Muncie saw it first at the Rivoli! 1954 Rivoli promo courtesy of David Battas, Sr.
Another cinema classic that has been near and dear to the hearts of movie lovers since 1939 is David O. Selznick’s epic Gone with the Wind. The film received 10 Academy Awards (8 competitive, 2 honorary), a record that stood for 20 years. In the American Film Institute’s inaugural Top 100 Best American Films of All Time list of 1998, it was ranked fourth. 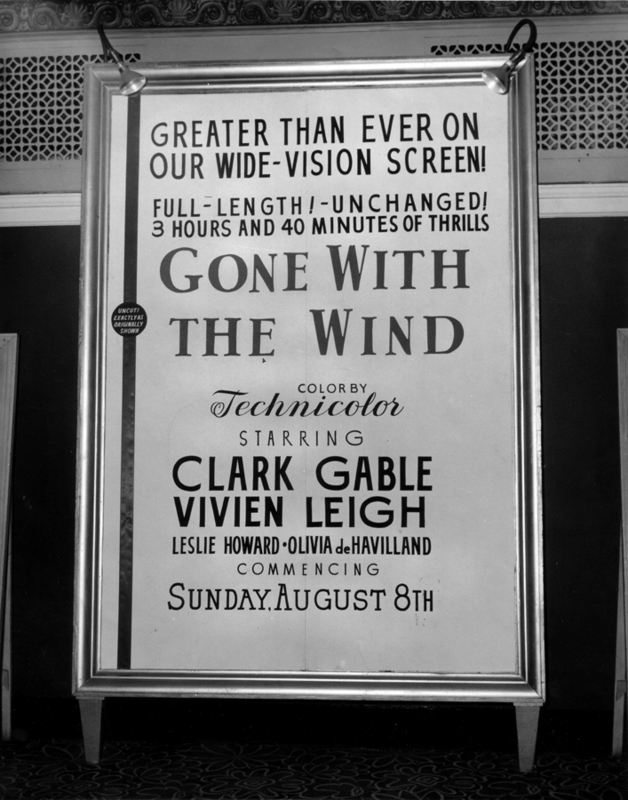 Gone with the Wind played at the Rivoli in February of 1940, following its December premiere in New York City. The film also played at least 2 times in later re-releases, first in 1954, and a second time in January 1969, to commemorate the remodeling of the Rivoli and installation of a new projection screen. The 1954 release was the first time the studio issued the film in widescreen format. 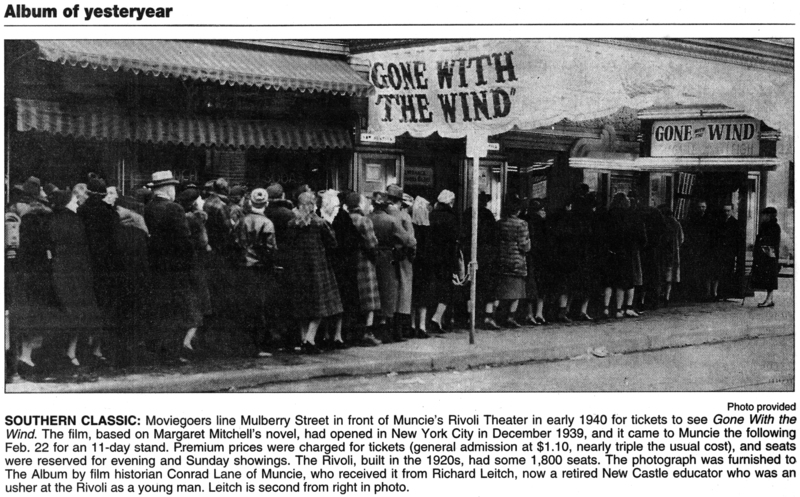 Rivoli - 1940 -The Muncie Star Album of Yesteryear, 1987. 1954 Rivoli photo courtesy of David Battas, Sr. 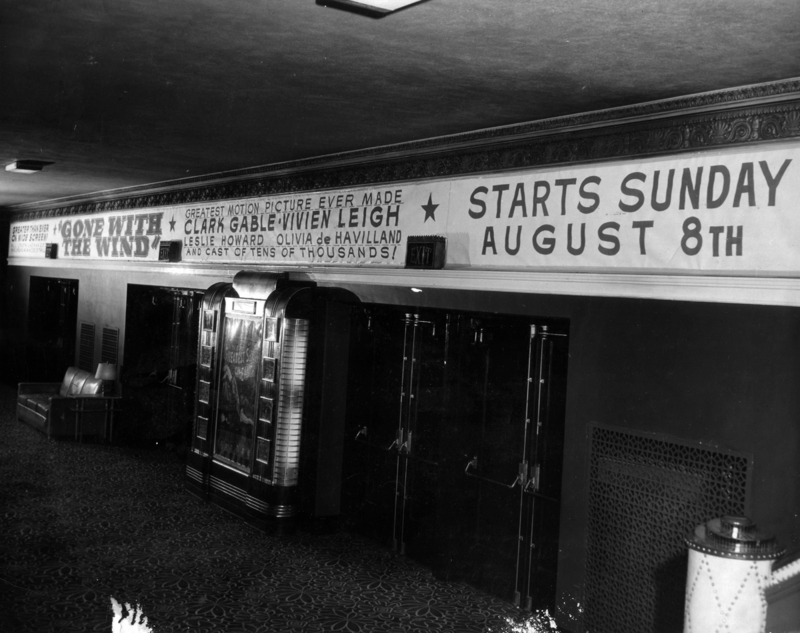 I love this look at the Rivoli’s theater lobby from the 1954 re-release of GWTW. Note the original ornate stairwell banister at the far right of the frame. 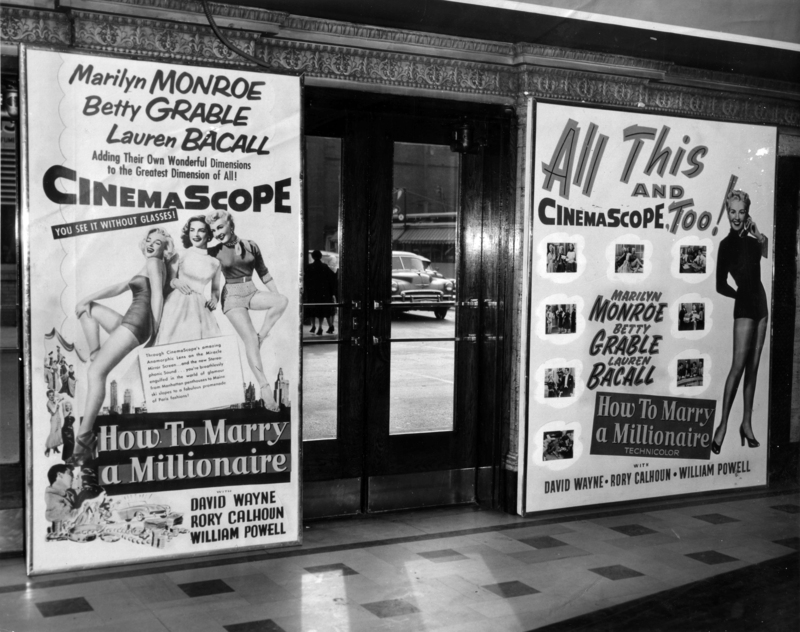 The massive art deco promotional display was surely an effective attention-grabber for movie-goers in the 1950’s. 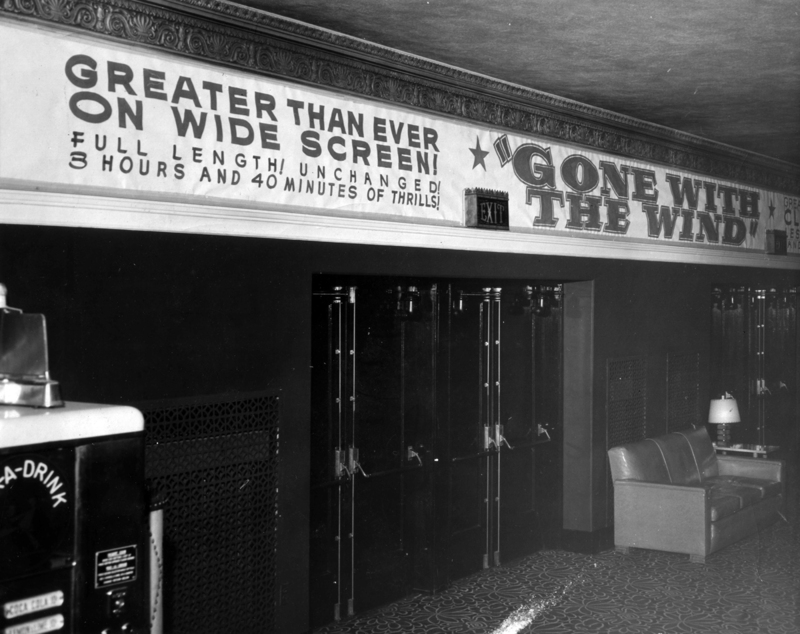 1954 Rivoli photo courtesy David Battas, Sr.
Here’s an alternate view of the 1954 Gone with the Wind lobby promotion. A soft drink vending machine is visible at left, and the ornate ceiling trim plasterwork is prominent in this angle. So… what other famous and memorable films do you remember seeing at the Rivoli? Folks from my age group invariably mention 1980’s The Empire Strikes Back, arguably the best of all the Star Wars films. I’ve also read comments from Rivoli fans about seeing the movie Harvey with James Stewart. For my part, I have often talked about seeing the breathtaking cinematography of The Man from Snowy River and marveling at its outstanding soundtrack (presented on a newly installed multi-channel audio system at the Rivoli) in 1982. I have to admit, regardless of the quality of the film, I treasure each and every time I visited the Rivoli. For me, the true movie magic was found as I sank into a chair with a box of popcorn and cast my gaze around the room, marveling at the giant asbestos curtain, the plasterwork, the ceiling dome, and the stage itself, as I waited for the movie to begin. When the movie ended, there was always the opportunity to come back and experience the wonder of the Rivoli once more. However, on January 11, 1987, when the final curtain fell…I knew there would be no encore. -John Disher, 25 years later, January 11, 2012. Enter your email address to follow the Rivoli blog and receive notifications of new posts by email.